Starboard: Unit 35C Lot 85; TOT ID# 2370N. New Listing .... 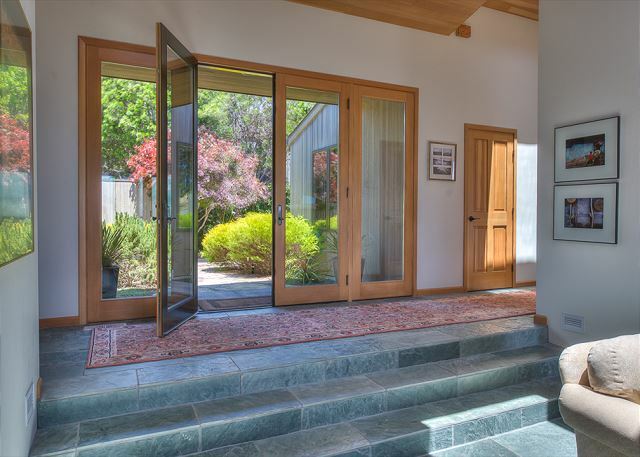 Your vacation begins as you walk into this beautiful Sea Ranch home. 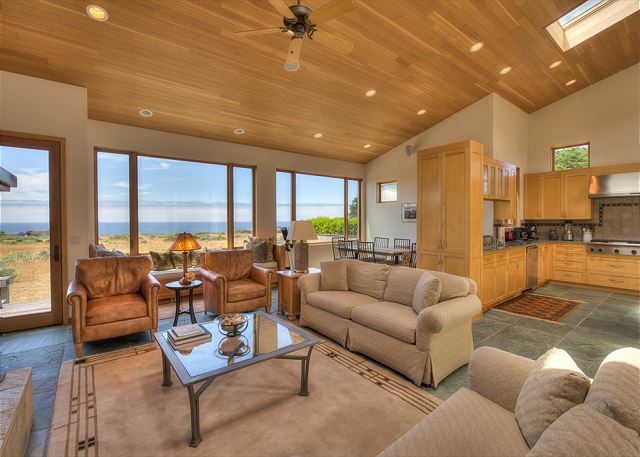 The ocean view is fabulous as you step down into the living room, dining room, kitchen with open floor plan. There are 2 queen bedrooms and 2 bathrooms. A media room is available for your enjoyment. Garage is available for your use. Linens are not provided in the home. As always this house is so comfortable. The kitchen is so well appointed and well stocked with sundries. This is such a beautiful home! Exceptionally clean and comfortable. The kitchen was well stocked and had every appliance imaginable. 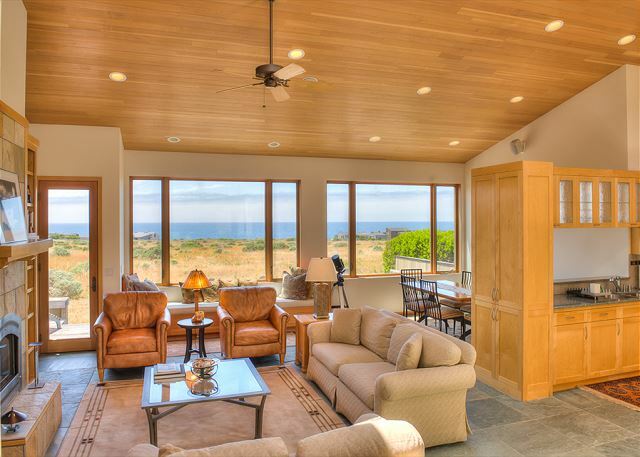 The meadow and ocean view from the living room area is lovely all day. The gas fireplace was easy to use and created a nice ambiance while the weekend storms passed over. 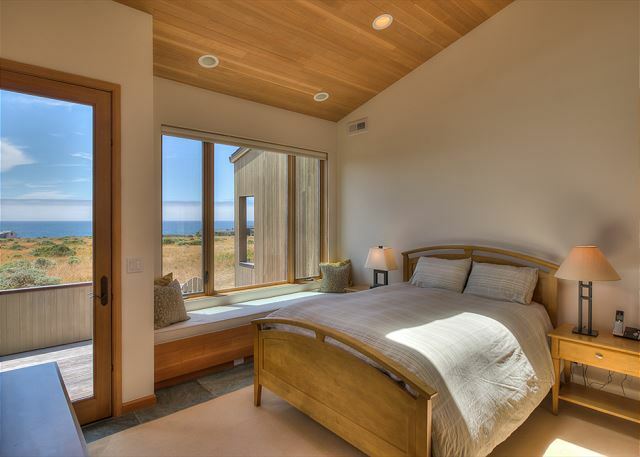 The master bedroom has a beautiful sunrise view. 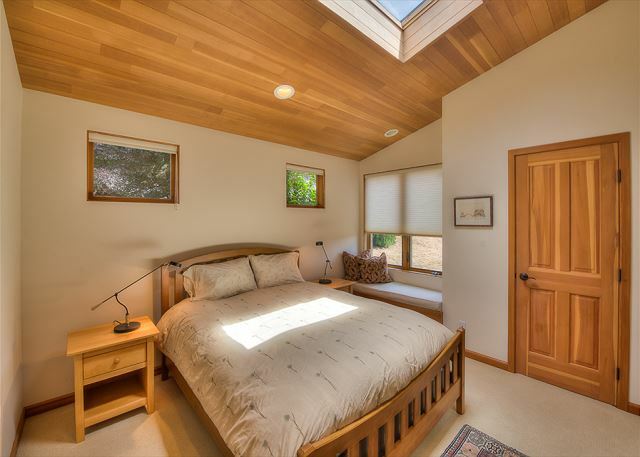 There are window blinds in the master bedroom, however there's no need since the nearest homes are far from view. 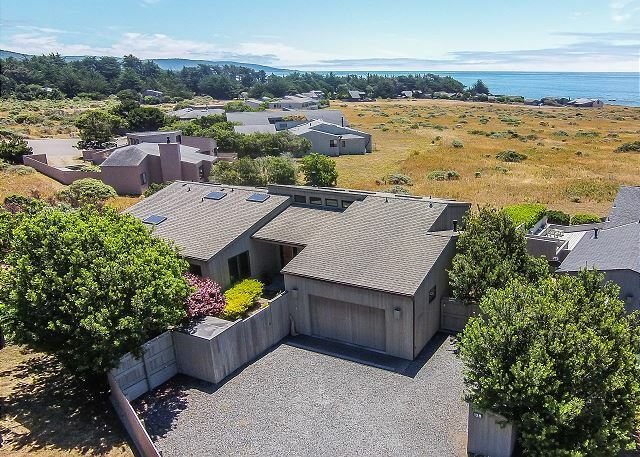 The home is a short walk to the bluff trail and beach, and located at the north end of Sea Ranch which makes for a short drive into Gualala. 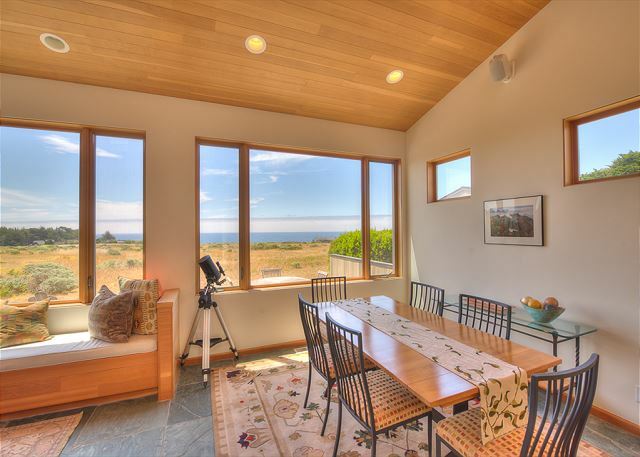 Having stayed in a number of Sea Ranch rentals, this is by far the nicest. We hope to come back soon. 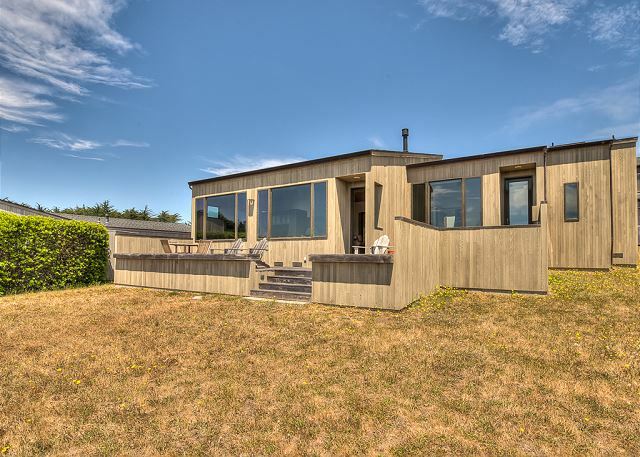 Starboard is a wonderful, small house with great blue water views. The kitchen was well stocked and any house where you can cook and still look out to the ocean gets an A in my book. The TV wasn't great, only broadcast channels from the Bay Area. The WiFi was excellent. At first I thought the $250.00 cleaning fee was excessive until I walked into the house. So clean, even the windows were clean which really important for the views. Just really enjoyed using a house that was so clean. It is a walk to get to the Bluff Trail. Not hard, just a distance. I would rent this house again. 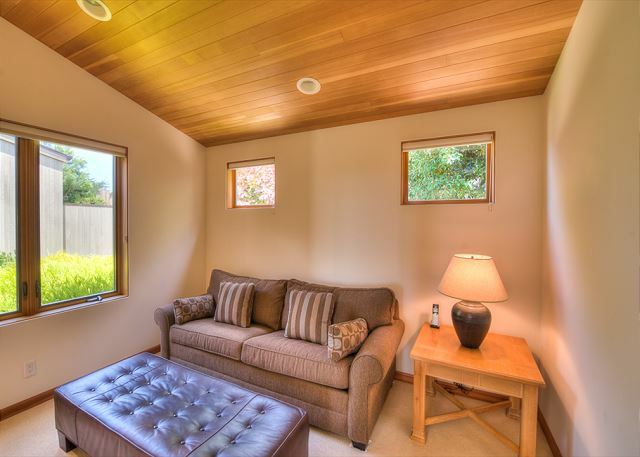 The house inside is as inviting and comfortable as the pics show. 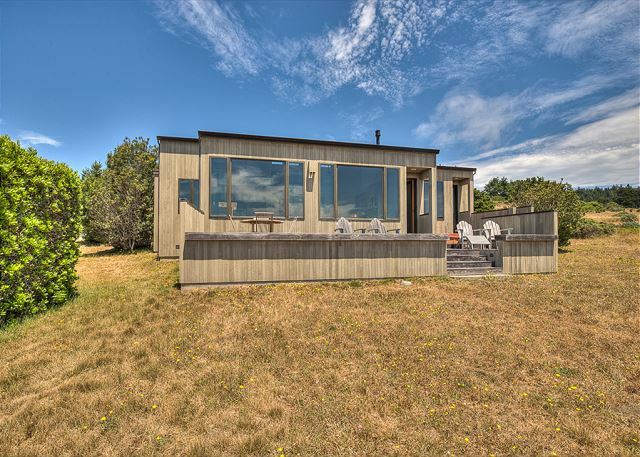 Not your rustic older Sea Ranch cabin, this is a spacious, full-fledged house with all the modern amenities. Gualala is very close as are the trails along the cliff. 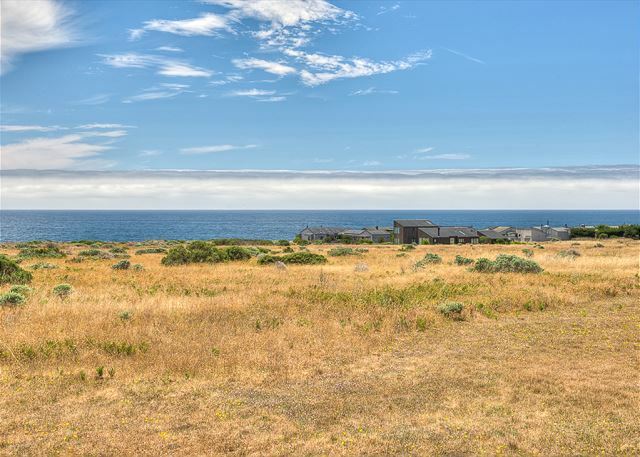 Some may find the scrubby meadow that separates the house from the ocean less than attractive, cutting off the sounds and smell of the water, and the patio needs a table umbrella for shade on sunny days. 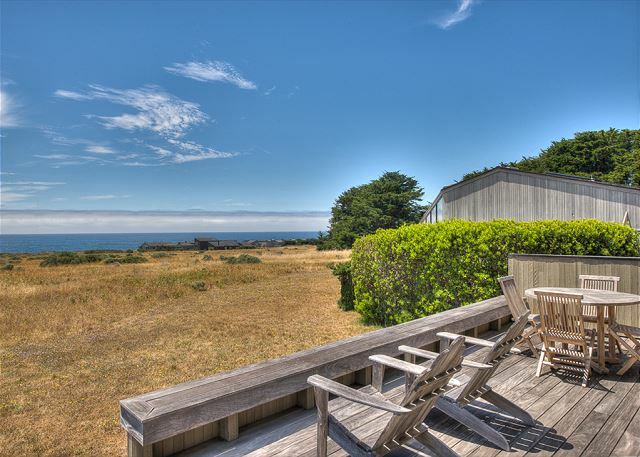 But overall we found the house nearly perfect for a relaxing getaway in beautiful Sea Ranch. Not right on the bluff but great deal for the cost, and only a 0.4 mile walk to the bluff trail. Very happy with it. A really nice, comfortable house. Also very nice that there was a wine fridge in the garage. Starboard is a lovely property. Clean, modern, with a great kitchen fully stocked for all your needs, great light throughout the house and excellent views of the ocean. We took advantage of the deck and the hot tub every day to sit and enjoy the view. The walk to and from the ocean bluff was perfect and we did it multiple times a day. The pool is just short walk or drive away. Don't forget your house id etc. We picked up delicious pastries and fresh bread from 2 Fish Bakery in Stewarts Point one morning. 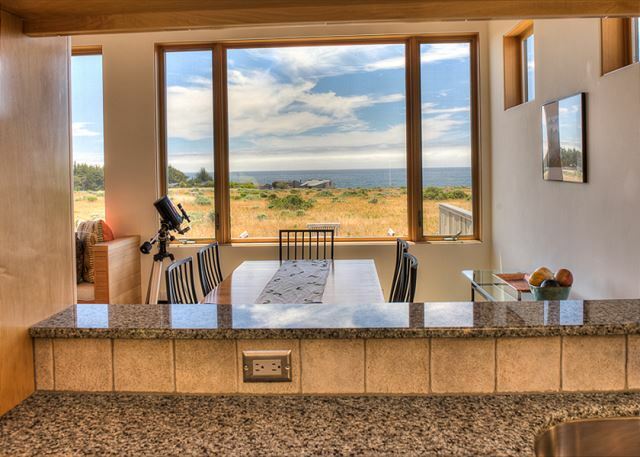 We love SeaRanch and would definitely stay at this house again. It was perfect for our family of three. Beautiful house with great view. Sad that it is not dog-friendly. Lovely stay but had to deal with very strong winds to be out on the bluff. Modean G from EL DORADO HILLS does not recommend this vacation rental. TV was terrible. This alone will keep us from returning. This house was beyond our expectations in every way! I took my adult twin daughters to enjoy time away from everything to relax and unwind and boy did this house deliver. The views, furnishings, surroundings and general feel of the house never stopped amazing us. We also enjoy cooking and were pleasantly surprised that the house was fully stocked with everything needed to enjoy baking and preparing meals. This is the second year we've rented this house and now it's our go to. Love being in the meadow as there is very little wind plus the fabulous view. Thank you to the owner for sharing!! 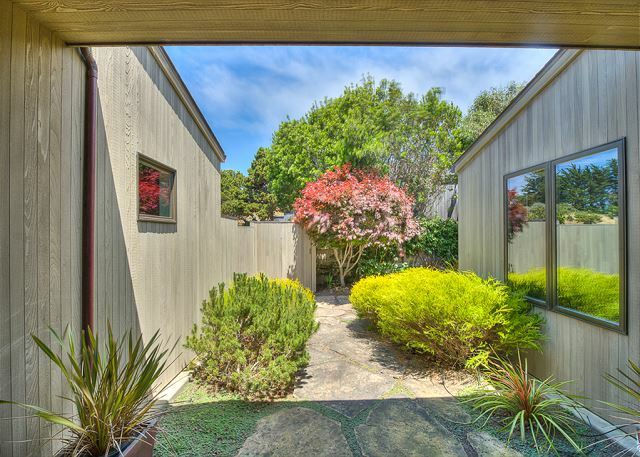 A nicely appointed house with wonderful views of the meadow leading to the ocean. 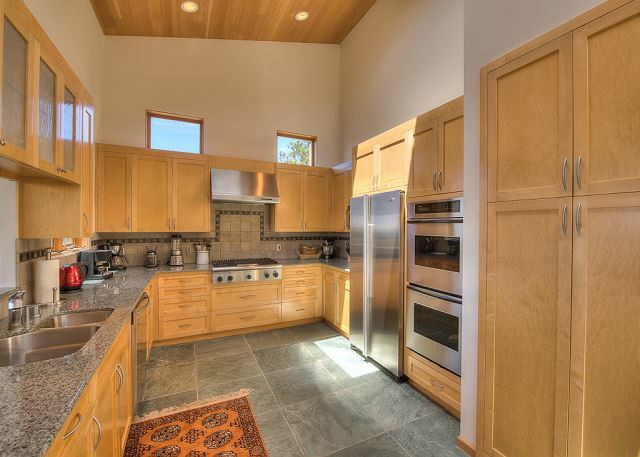 The kitchen was definitely an added bonus. The home was perfectly lovely and comfortable. I appreciated that the soap and bathroom supplies were ample. 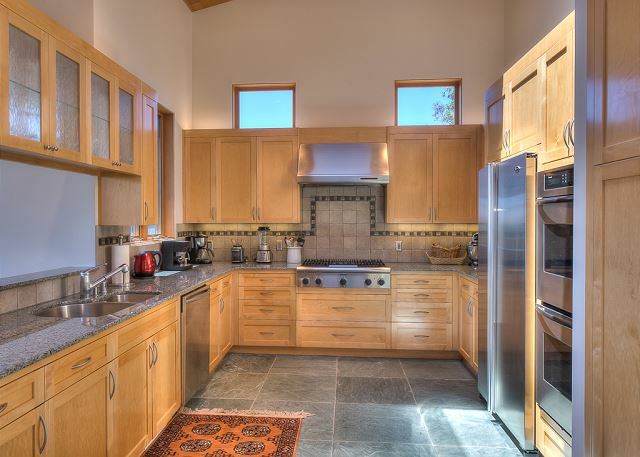 The kitchen is well stocked with appliances and cookware. We LOVE this house. Can't wait until I can reserve it for next summer. That says it all! Our stay at Starboard was wonderful. The views, the wildlife, the proximity to everything was better than expected. The home was well equipped, cozy, and quiet. We look forward to returning! Excellent experience with our stay at Starboard House. Property was beautiful and very well maintained. High quality all around. Close to walking areas. Enjoyed very much! beautiful place. improvement suggestion: a detailed manual on how to operate the fireplace, DVD and other players, the thermostat. Our holiday rental looked exactly as it did in the photos and the view was even better than we expected. The house was perfectly equipped for cooking and entertaining. What a gem....we look forward to returning.....same time next year! 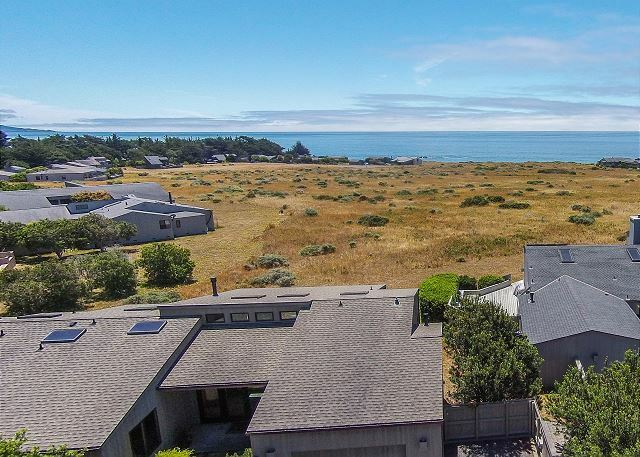 We have stayed at so many wonderful homes at Sea Ranch. Nothing compares to this one. This home is so well appointed and well stocked. The deck is perfect for meals or just looking at the ocean and wildlife passing by. We've already booked this home for next year. I highly recommend Starboard for your get away!!! This rental company is the most friendly and accommodating of all!!! We so much enjoyed our stay at Starbord. We wanted to rest and relax, check. We wanted to take so walks along the cliffs, check. And we wanted to watch some movies, check. It could not have a more perfect weekend in a truly beautiful home. We had a great time in a wonderful location and house. The only very minor thing I would recommend is that the house owner provide less heavy bed coverings. There was one lighter blanket but it was actually very dirty. In the summer those heavy comforters are just too hot and something is needed. Thanks. Hope to see you next summer. This is the perfect place to get away from it all. The place to relax, regroup, or just want peace and quiet. 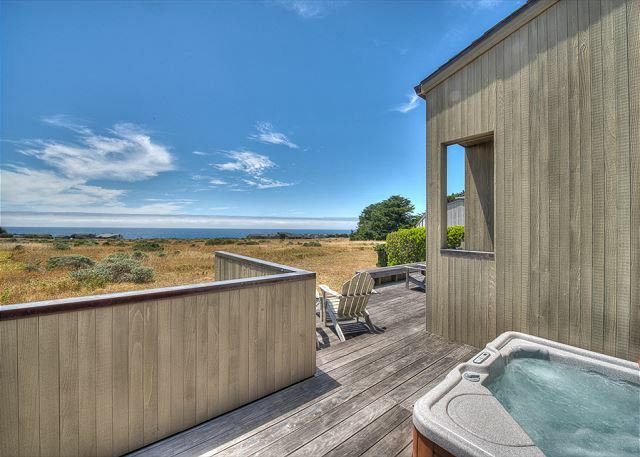 My husband and I have been coming to Sea Ranch for 31 years and Starboard is the best yet. We hope to enjoy this place for many more years. 2nd or 3rd time there at Starboard--have been to probably 7 or so different properties, this is best yet. 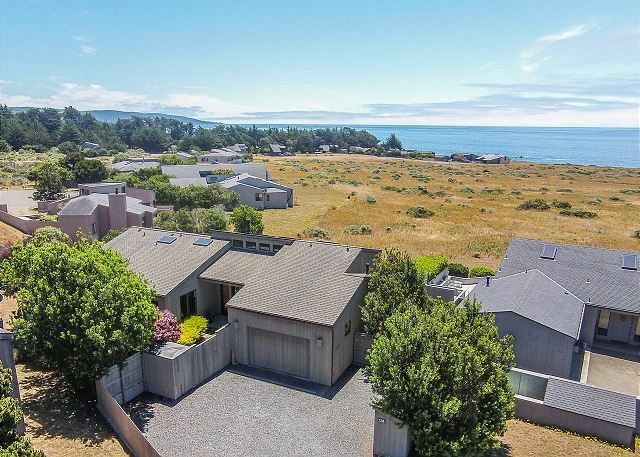 Spacious and comfortable home with nice ocean views! Nicely decorated and well stocked. A pleasure for couples and or families. The people at ocean view properties were a pleasure to work with as well. Couldn't be happier. We had a wonderful time and the house was perfect. We will be back next year. Thank you Ocean View Properties. This beautiful home was even nicer than we hoped or expected. Comfortable, spacious, well appointed, well stocked. 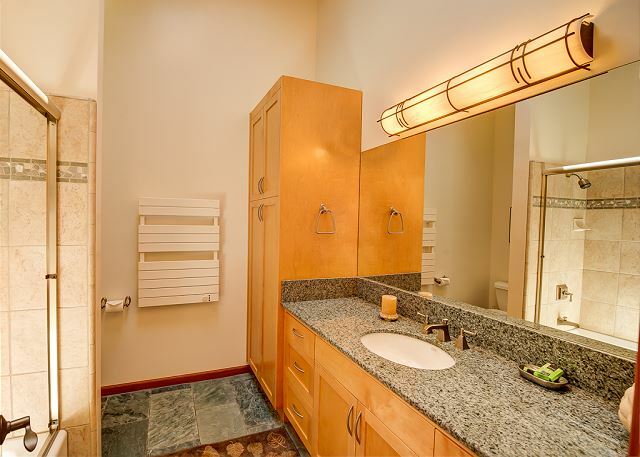 It is well-built with high quality materials and appliances. Can't wait to return!